P&O Maritime has been operating in the maritime industry since the 1960s and has evolved over the years, expanding the services offered, moving into new geographic locations and establishing a regional management structure. P&O Maritime originated from Beaufort Shipping Agency, the ship agency and operations of the Peninsular & Oriental Steam Navigation Company vessels in Australia. In the late 1960s, with the development of the offshore oil and gas industries in Australia, P&O transferred several vessels to Australia and in 1968 established P&O Offshore Services. This company subsequently built over 20 vessels in Australia and operated them within Australia and South East Asia. In the mid-1970s, P&O invested in a salvage operation, United Salvage, which successfully grew its business around Australasia. This activity was subsequently sold to Adsteam Marine (now owned by Svitzer). P&O Maritime formed a joint venture in Singapore, Austen Maritime Services, a 50/50 joint venture with the Stena Group of Sweden. Austen Maritime supplies manning, agency, ship chandlery and other general services throughout South East Asia. P&O Maritime secured a long term contract to build and operate vessels in Papua New Guinea carrying copper concentrates along the river systems and coastal areas. In 1990 P&O Maritime secured a long term contract for the provision of shipping services to the Australian Antarctic Division. P&O Maritime managed the design and build of the research supply and expedition icebreaker Aurora Australis, which is owned, managed and crewed by P&O Maritime. It is used by the Australian Antarctic Division for cargo resupply, expedition transport and seasonal marine science and research in the Antarctic. P&O Maritime acquired 50% ownership of Carpentaria Shipping Services (CSS). CSS is a joint venture with the local indigenous community which owns and operates (under P&O Maritime’s management) one self- discharging bulk carrier in northern Australia. P&O Maritime formed a joint venture with Serco Asia Pacific to successfully tender for the outsourcing of the Royal Australian Navy Port Services and Support Craft activities, called Defence Maritime Services (DMS). In 1997, P&O Maritime formed International Offshore Services (IOS), a joint venture with Farstad shipping of Norway, to own and operate offshore supply vessels within the Australasian region under the management of P&O Maritime. IOS began operations in early 1998 with seven vessels and within five years had grown to 20 vessels. 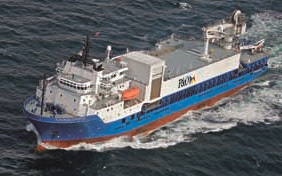 The rapid success saw the need for the ships to operate in a global market, which began to conflict with other Farstad operations and subsequently Farstad acquired the P&O Maritime interest in 2003. In 1998, P&O Maritime acquired the vessel Southern Supporter from Australian Maritime Safety Authority and secured a five year contract to provide the vessel for navigational aids maintenance work. Southern Supporter is on long term charter to Fugro in support of their geo-survey requirements for the Australian offshore oil and gas industry. The P&O Maritime established the Irish business in Galway to provide technical and operational support services and ship management of the Marine Institute Ireland’s marine science and research vessels RV Celtic Explorer and RV Celtic Voyager. P&O Maritime’s JV company, DMS, was successful in 2005 with a tender to manage maintenance and support of the Australian Customs Service eight Bay Class Patrol Boats under a six year extendable contract. DP World purchases the P&O Group of Companies, which included P&O Maritime. P&O Maritime was successful with a contract to provide management and operation services for Zinifex’s (now MMG Century Limited) self-discharging bulk carrier MV Wunma. The vessel operates from the port of Karumba on the south eastern side of the Gulf of Carpentaria in north Queensland, Australia. This operation supports Zinifex’s Century Mine, the largest zinc and lead mine in Australia. In 2007 P&O Maritime acquired the French Antarctic resupply vessel L’Astrolabe and secured a long term contract to operate the vessel for Antarctic resupply and marine science and research for Institut Polaire Francais Paul Emile Victor and Territoire des Terres Australes and Antarctiques Francaises. P&O Maritime expanded into the United Arab Emirates taking over operation, crewing and maintenance of more than 20 vessels including tug boats, pilot boats and line boats in Dubai. This provides vital support to DP World's flagship Jebel Ali terminal and Port Rashid. P&O Maritime expands its operations into South America with the acquisition of 70% of the shares in the Dos Santos Group Bulk Barging business based in Paraguay. This business provides pusher tugs and bulk barges that operate on the Paraguay/Parana river waterway for the transport of grain and iron ore. Offices are established in Buenos Aires, Argentina and Asuncion, Paraguay. P&O Maritime’s presence in the European marine science and research vessel market was further strengthened in 2009 following its success in England's Centre for Environment, Fisheries and Aquaculture Science (CEFAS) international tender process. Services provided include vessel operation and management of RV Cefas Endeavour and its associated research equipment. P&O Maritime moves into a regional business unit structure and the regional business units are Australasia, Europe, Middle East & Africa and South America. The Corporate Office will provide governance and support for the regional business units. P&O Maritime were successful in securing a contract for the provision of towage services to DP World in the Port of Sokhna, Egypt. Service provision for this contract was enabled through the acquisition and mobilisation of two tugs from Spain. Joint Venture, DMS signs contract with Austral to support the build and operation of eight new Cape Class Patrol Boats for Australian Customs and Border Protection Services. Two new pusher tugs are constructed (P&O Mburucuya and P&O Ceibo) and twenty four barges for use in the South American operation along the Rio Paraguay. The Santa Ana, one of three Incat catamarans designed specifically for use as a Renewable Support Vessel within the offshore wind farm market was finished and commissioned for work. The other two vessels, the Siroco and the Chinook are delivered later this year. In 2011, the European Supporter is converted from the Oceanic Viking and sent to Europe. Conversions to the Vessel meant that it could be utilised to perform a variety of tasks, such as offshore survey roles, construction projects or for laying inter-array cables for offshore wind farms. P&O Maritime secured a long term contract to build and operate a 90m Coastal Oil Tanker, carrying condensate along the Fly River, Papua New Guinea, to support the Stanley field development located in PRL4 in PNG. Following the Company’s restructure, the Corporate Office function moves to Dubai and in November, P&O Maritime signs an agreement to sell the remaining 50% equity stakes in DMS to its joint venture partner Serco Group.